All along I thought I’d use a stitch pattern and a single color, but when I sat down and thought about them I kept coming back to colorwork. I wanted something subtle, so at first I thought I’d just alternate between 2 colors to get a really muted, shaded effect. I started drawing out little stitch patterns and eventually I got to an actual pattern. Now, I know you can’t clearly see what pattern is there. Occasionally the 2 colors of yarn that are next to each other almost match. But I like the overall effect — it’s blended, but you can definitely tell something is going on there. I’ve used a total of 4 colors — the MC, plus 3 others in the stranded area. The stranded area can use little scraps — making this the perfect project for using up scraps from leftover socks. My stranded knitting technique is probably my weakest and this project is giving me some great practice. Gauge isn’t terribly important as long as I can slip them over my ankle and let them slouch a bit on my leg. Blocking will be my best friend for this project! I’ve found my stranding is pretty even in the middle of the row. 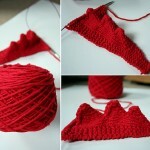 My problem is deciding how loosely to strand when it’s between the 2 needles. I still need some practice before I know just how much to leave. I was thinking about cutting a piece of cardboard and inserting it so the yarn would be forced to follow the shape of the cylinder. I’m open to other suggestions though. Maybe it’s just something I need to work on for a while longer? 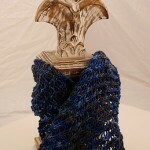 The stitch pattern is really versatile. I can easily see making these up as armwarmers as well, and with less stitches they could definitely be made in a heavier wool. 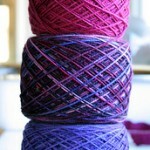 I’m already thinking about other lone balls of yarn I have in the stash to pair up for a totally different look. All this inspiration from “too much” sock yarn! You can see the pattern, but I like that it’s almost more suggested because of the colour blending. It’s gorgeous no matter how you look at it! Oh wow, those are looking great! I love the subtle contrast in some parts, and more visible contrast in others. Gorgeous – I like the subtlety of the color pattern! Watercolor is the perfect name for this… the colors blend beautifully. This looks awesome! I like how the edge of the colorwork blends into the rest of the legwarmer, rather than being a sharp line. Have you decided if you will be making the ankle fitted (to keep the warmth in) or flared (to fit over shoes or boots)? I really like the multiple varriagated effect! I’ve thought about doing something using a variagated and a solid in FI, but not multiple variagated. I hope you like them as much as I do! That is really nice, kind of like a Monet painting. Wow, I love that! It looks very Impressionist to me. 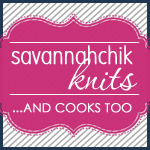 Stranding knitting technique? Thanks for the homework. Prooves that there cannot be too much of a good thing! What a great idea! It’s a beautiful effect. Great work Jodie. So effective. Those are gorgeous. I love the water color blurred look. For stranding across needles I recommend weaving instead of stranding. Try the Philosophers Wool method of weaving if you haven’t tried it before. They have a brief video of it on their web site. As soon as I clicked on your site’s bookmark – the pic’s colors just popped out at me. You chose some gorgeous colors there! Beautiful! I love how the colors blend into each other. I agree with the previous commenter who said it was like a Monet painting. That’s exactly what it made me think of! The colors are beautiful! Really lovely work. Stranding – way beyond me at the moment. Hope that will change one day. Truly lovely Jody! Well done! OOo I love them! Can’t wait to see what they look like on….those would look great slouched over a pair of boots…or anything. seems to have a misprint for the yarn requirement of the Swedish Heartwarmer Shawl. Only the Winter Sky colorway requires 1 skein — the other colorways require 2. Hi! 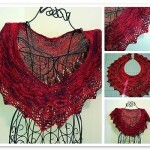 Unrelated to this post, but I have (finally) finished my River shawl – could you update me? Thanks! PS. 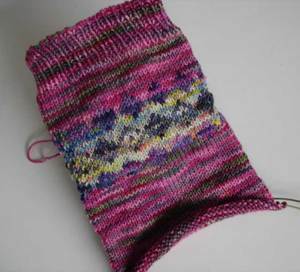 Love the watercolor leg warmers – they look great! I love the blend of colors- amazing! Here’s something to try to solve the stranding between 2 needles problem — turn the knitting inside out (so you will be knitting on the side that is AWAY from you instead of the side that is closer to you). That will make the stranding be on the OUTSIDE of the knitting (instead of the inside) so you don’t need to worry so much about how loose to make the strand. This technique really helped me when I was stranding on DPNs. Hope that made sense. I know I saw a picture of it somewhere on the internet, but can’t remember where.